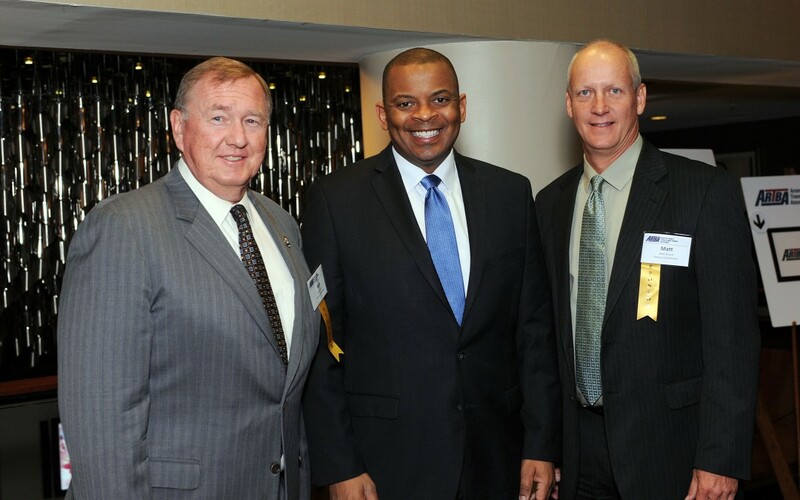 ARTBA Chairman Nick Ivanoff, U.S. Transportation Secretary Anthony Foxx, and president of ARTBA’s P3 Division and COO of Plenary Concessions Matt Girard, attending ARTBA’s “P3s in Transition: The Next Chapter”. More than 200 transportation design and construction executives, financial services and consulting professionals, and government officials came to the Nation’s Capital July 15-17 to discuss the role of public-private partnerships (P3s) in financing transportation infrastructure projects. Participants at the 27th annual conference, under the theme of “P3s in Transition: The Next Chapter,” included more than two dozen federal and state transportation officials, as well as a unique panel of house transportation committee chairs from four states who shared their respective views on P3 policy. With surface transportation reauthorization activities reaching a critical point on Capitol Hill, P3 Conference attendees heard the latest details about efforts to fix the Highway Trust Fund from U.S. Transportation Secretary Anthony Foxx, Senate Environment & Public Works Committee Chairman Jim Inhofe, (R-Okla.), Senate Finance Committee Ranking Member Ron Wyden (D-Ore.), and a panel of key congressional staff. Inhofe and Wyden said that private negotiations over a six-year surface transportation bill will continue through this weekend, with a proposal expected to reach the Senate floor for a vote during the week of July 20. In particular, Chairman Inhofe urged conference attendees to contact senators who voted against the last long-term transportation reauthorization, called MAP-21, in 2012. At the same time, the U.S. House of Representatives July 15 passed a five-month extension of the current reauthorization, which means the two proposals would have to be reconciled in a conference committee before the July 31 deadline. Besides the “headliners” described above, the P3 conference also featured more than 50 speakers in 15 interactive sessions. Key topics included the long-term future of P3s in transportation, unsolicited proposals, current and prospective federal financing tools, emerging P3 markets, the views of ratings agencies, and details on P3 mega-projects in the operations and maintenance stage. Other presenters included private sector professionals in construction, design, finance, law and academia. ARTBA’s P3 Owners Council, a peer group exclusive to public agency representatives, met for the second year. During the conference, ARTBA recognized Ananth Prasad, HNTB Corp. senior vice president and former secretary of the Florida Department of Transportation; and Bryan Kendro, former director of the Office of Policy & Public-Private Partnerships at the Pennsylvania Department of Transportation, as “P3 Entrepreneurs of the Year.” The I-95 Express Lanes project in Virginia received the “Project of the Year Award.” See separate Newsline story. At the same awards luncheon, Dusty Holcombe, deputy director of the Virginia Office of P3s, assumed the presidency of ARTBA’s P3 Division for the coming year. For more information on the conference and ARTBA’s P3 Division, visit www.artbp3.org.